Crocheting is a lovely needlework art that has a wide variety of stitches you can use to create many things. 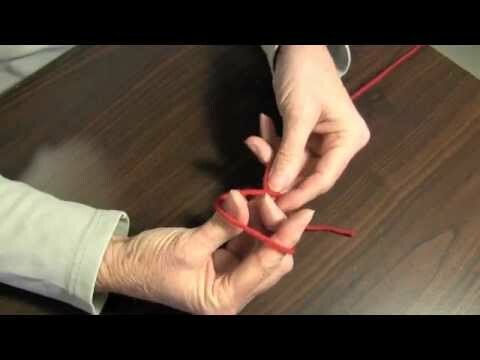 In the Needlepointers.com Crochet department, you can learn different crochet stitches and techniques—including broomstick lace, filet and hairpin lace—as well as get a plethora of project ideas and free samples. Our own Youtube videos will show you different stitches and give you project ideas. To help you with this craft, we feature a yarn calculator and a link to handy conversion charts (such as U.S. to English, steel hook and thread and yarn sizes). In addition, our online shopping center allows you to order your yarns, hooks, patterns and other crocheting supplies easily and quickly. Looking for Knitting? Our Knitting department is where to go. 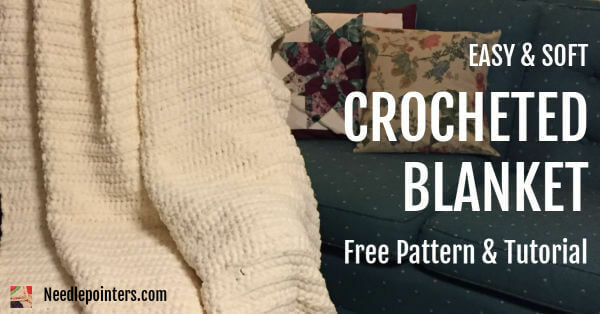 A free pattern and tutorial on how to make a gorgeous blanket for any size, from baby blanket to king-side bed. The pattern is so simple even someone learning to crochet can make it. 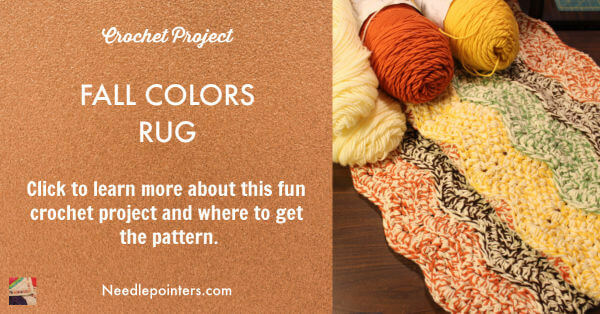 Make yourself a pretty Fall Colors rug from a pattern available from Annie's Craft Store. This rug is easy to make and can be made in any color scheme. This would be a good project for a beginner crocheter. 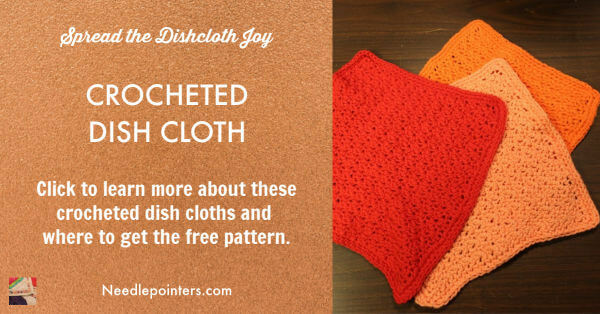 With this free crocheted dish cloth pattern, you can stitch up fun and easy dish cloths. Chris at Needlepointers.com has been making these dish cloths and would like to tell you about them. Get the free pattern and purchase supplies for making this pattern. You can make this pretty crocheted dragonfly pencil pouch with a free pattern by Darn Good Yarn. 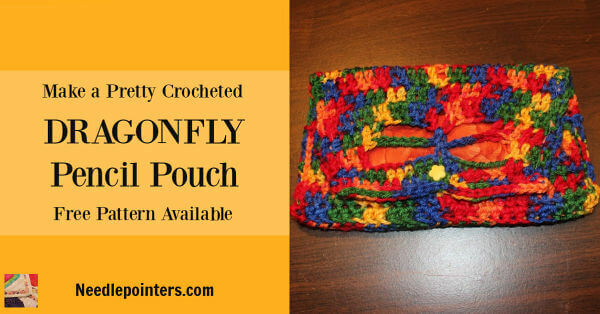 To learn more about this project and get the pattern visit our Dragonfly pencil pouch page. 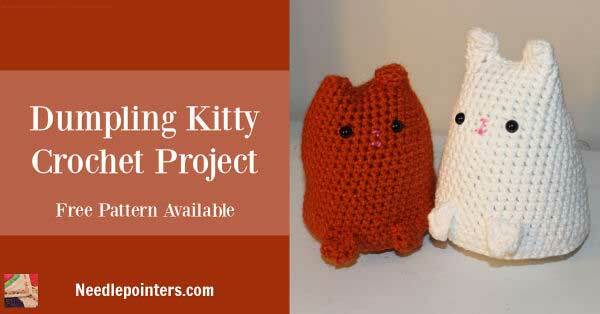 Learn about this cute crocheted cat called Dumpling Kitty. The pattern is by Sarah Sloyer of Critterbeans and is free. 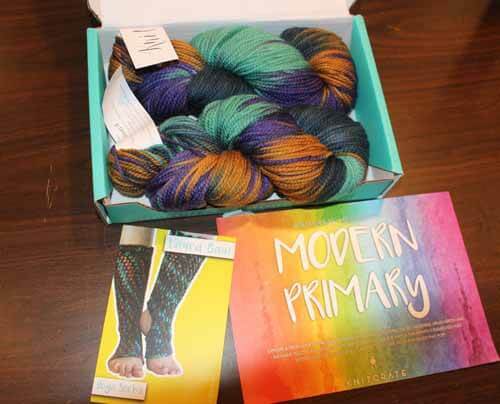 Learn about the yarn we received from KnitCrate in their July monthly subscription package. Find out how to join this subscription plan. 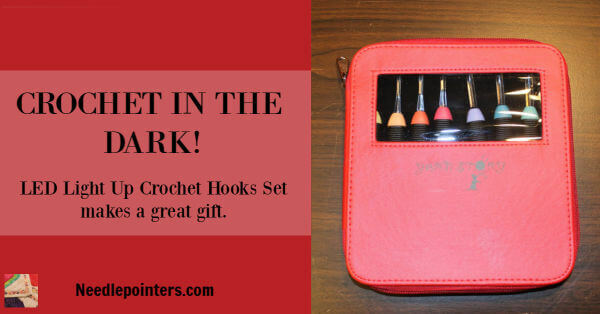 With light up crochet hooks you can crochet in the dark. Learn about these crochet hooks by Yarn Story watch our video and reading our product review. 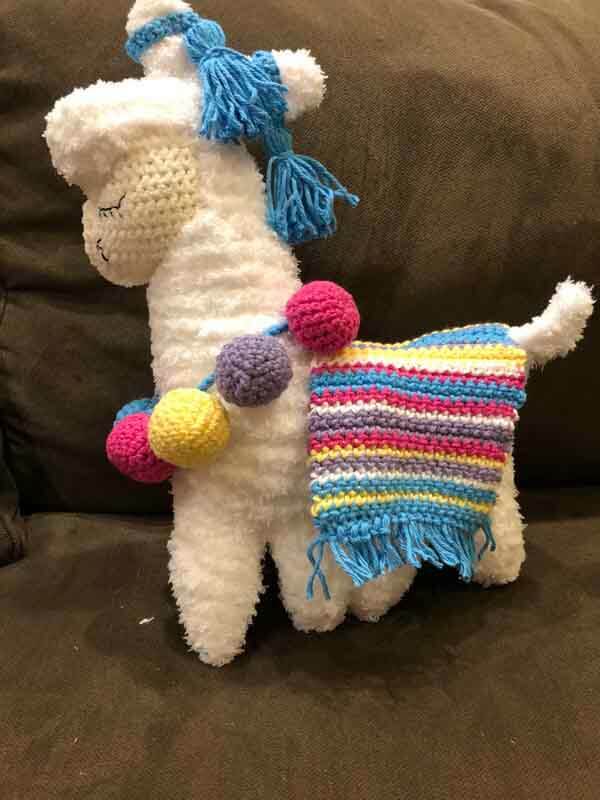 This colorful ragdoll llama was recently crocheted by Chris with a free pattern by Spin a Yarn Crochet. The Bernat Pipsqueak yarn gives the llama a fuzzy and cuddly fur. The charming decorative accents include a cute bobble necklace, bright multi-colored blanket and tassels on ears. To learn more about this project and get the free pattern click the above link. Annie'sExpress your creativity while supporting Alzheimer's and dementia patients. These designs are full of interesting beads, bobbles and textures that many patients find reassuring and comforting. Each design is made using different types yarn and textures. Patterns are given for each embellishment used, or you may create your own. This magazine features creative patterns for crocheted toys, dolls, doilies, clothing, afghans and more. Stitch a pair of these adorable sneakers in every color! 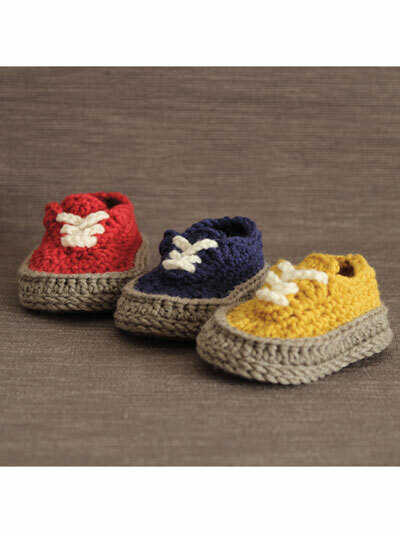 You will love making these fun sneakers for your baby or as a baby shower gift. This easy-to-stitch hooded scarf with an oversize hood and deep pockets is both cozy and useful! Turkish bead crochet is easy and fun. With this pattern learn how to make a Triple-Wrap Bracelet, Slip Stitch Bracelet, Half Double Crochet Bracelet and Watchband.